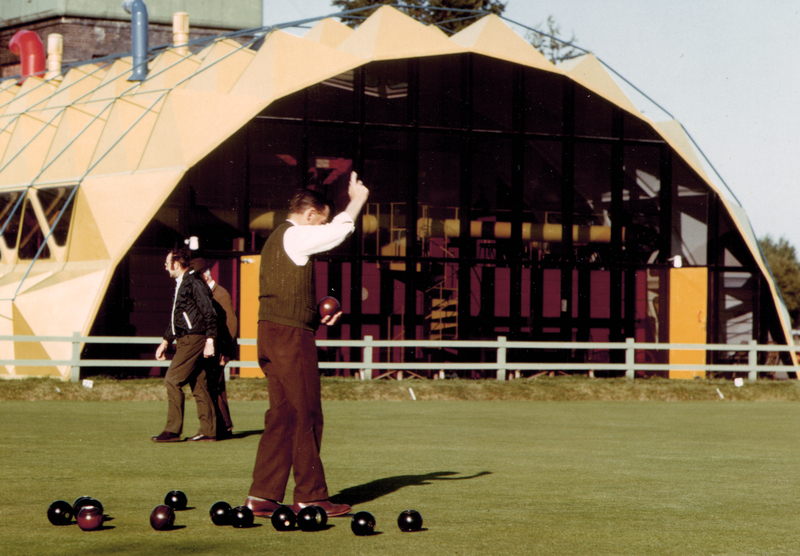 When Wolverton Sports Club approached Milton Keynes Development Corporation for help for a new sports pavilion to replace their rotting wooden one, they were offered the services of Swiss architect Pierre Botschi, who was experimenting with fibre glass structures. His design for a pavilion to house members of the cricket, tennis and bowls clubs was brilliant yellow in colour and its shape was summed up in its nickname – The Pineapple. Although the large window at one end overlooked the Bowls Club, their members decided to stay put in their converted railway carriage. Unlike normal cricket pavilions, with a balcony overlooking the pitch, this pavilion had no entance pitch side. Its high internal roof meant large heating bills, which the club tried to pay for with discos, but the noise annoyed local neighbours. The club returned, dissatisfied, to the Development Corporation, and they agreed to replace the Pineapple with a more conventional brick structure. The old yellow pavilion was sold to a chicken farm in Somerset.